Here it is: bad collage and terrible criticism! Summary: Welcome to Twin Peaks, Washington! A guy goes out fishing and happens upon the dead body of a young woman, wrapped in plastic. As the community grieves the loss of the girl, Laura Palmer, an FBI Special Agent rolls into town, ready to guide the local law enforcement as they try to discover who killed her. * Sarah Palmer (Grace Zabriskie) seems to have heightened senses about her daughter and could stand to lay off the Virginia Slim 120s. Damn. *The pilot opens on a shot of the very lovely Josie Packard (Joan Chen) in front of a mirror, messing with her lips. As we see more, Ms. Packard has a very "kept woman" vibe, but there is definitely more than meets the eye going on with her. First name starts with "J," though, just in case that becomes important later on . . .
*That ceiling fan is creepy. *Dr. Jacoby (Russ Tamblyn) seems a bit . . . touched (to use proper psychological terms, affect is off, giggling at inappropriate moments, improperly forward with Cooper). He's probably on drugs. *"Nervous about meeting "J" tonight," WHICH J? This is a mystery!!! *Is that bank clerk Sheryl Lee dressed up in a wig and huge glasses? VERY FUNNY, LYNCH. I guess he just couldn't get enough of her. Okay, maybe it's a beer. 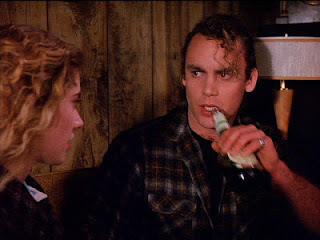 *WHAT THE HELL IS THIS CAT LEO JOHNSON DRINKING, CREME DE MENTHE? This is my favorite thing visually, so far. It's like he's this badass macho trucker but yet takes pulls from his fancy-bottled liqueur whilst threatening his wife for smoking multiple cigarette brands. 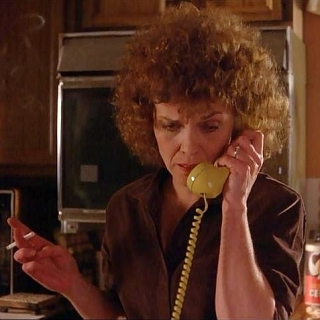 And it's hard for me to decide whose perm I enjoy more, Leo's or Shelley's. Do I need to say I disapprove of spousal abuse and how he belittles her? I DISAPPROVE. Rating: 🍩🍩🍩🍩 ( 4 doughnuts out of 4 possible). Overall, the way this pilot was written and directed really make it an outstanding television achievement. Nothing like this had been done on network television before---things like Pete Martell's constant mumbling to himself, the slow dolly down the empty hall in the high school while the principal announces Laura's death, Cooper's excitement over pie and coffee, and the unconventional pauses between lines of dialogue, reaction shots, and the nagging feeling that something is a bit off with every single person in this community--this is what happens when an amazing director does television. Oh, and spoilers, I guess. Labels: Agent Cooper, audrey horne, David Lynch, dr. jacoby, josie packard, Laura Palmer, Leo johnson, sarah palmer, shelley johnson, television, Twin Peaks, what up geeks? Apparently the drink in the bottle is a Molson. Mystery solved.